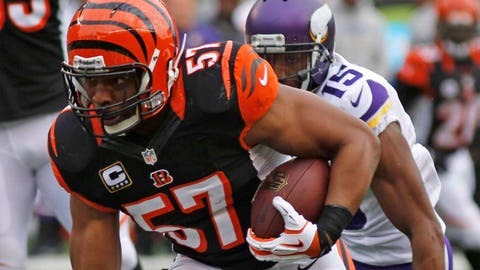 Cincinnati Bengals middle linebacker Vincent Rey returns an interception against Minnesota Vikings wide receiver Greg Jennings for a 25-yard touchdown in the first half. For the third time in franchise history, the Minnesota Vikings will end the season winless on the road. Sunday’s 42-14 loss at Cincinnati will end up as one of the most disappointing in a season filled with many disappointing losses. The Vikings (4-10-1) had built some momentum with two wins in the past three games. The offense found some rhythm with quarterback Matt Cassel and the defense had made enough big plays. Sunday’s letdown was on both sides of the ball. Sunday’s game, in a way, mirrored the blowout loss in Seattle earlier this season, when interceptions turned a close game into a rout. Only Sunday’s game turned in the second quarter instead of the fourth quarter, like in Seattle. The Vikings ended up minus-3 in turnover margin on Sunday, and the Bengals scored touchdowns off of Minnesota’s first two turnovers. Cassel fumbled on a sack on the third play of the game, which was returned 42 yards. Two plays later, Cincinnati scored a touchdown. The second turnover was an interception returned for a touchdown in the second quarter turning a 14-7 game into a 21-7 runaway that altered the Vikings’ ability to control the game on the ground. And like the Seattle breakdown, when Christian Ponder and Cassel combined to throw three interceptions in the span of six offensive plays, Cassel threw interceptions on back-to-back drives and in the span of three offensive plays. One aspect that had allowed Cassel to seize the job at quarterback was limiting turnovers. He was responsible for all four on Sunday. Meanwhile, the defense couldn’t get to Bengals quarterback Andy Dalton, who had his way in the passing game. Cassel was coming off the best passing yardage game by a Vikings’ quarterback since Brett Favre in 2010, seemingly putting an end to the constant questions at quarterback. Cassel completed 74.3 percent of his passes a week ago for 382 yards and two touchdowns. Cassel’s play went a long way toward Minnesota posting a come-from-behind win against Chicago, nearly beating the defending Super Bowl champion Baltimore Ravens and controlling Philadelphia a week earlier. But the Vikings were out of sync from the beginning on Sunday and Cassel wasn’t sharp. Several passes floated on Cassel and he was intercepted three times. He missed receivers and was 13 of 27 for 114 passing yards. The first half was especially troublesome, with Cassel going 5 of 14 for 52 yards passing. He did hit Jarius Wright for a 36-yard touchdown. Cassel felt pressure all game long and didn’t sit as comfortably in the pocket as he had done a week earlier. He was sacked four times and also scrambled three times for 16 yards. Trailing by a large margin early, Minnesota abandoned the running game and couldn’t sustain drives offensively. The Vikings were 0 of 9 on third downs in the game, 0 of 7 in the first half. One bright spot continues to be the development of rookie receiver and returner Cordarrelle Patterson. Cincinnati was willing to kick off to Patterson, which many opponents had shied away from lately. Patterson had four returns for 143 yards, with a long of 48 yards. He’s four yards shy of breaking the franchise record for return yards in a season. Patterson has been brilliant as a returner all season. His newest trick is his versatility and ability to run out of the backfield. Patterson actually led all ball carriers in yards on Sunday. He had three carries for 54 yards rushing, including a nifty 35-yard touchdown run, taking a toss out of the backfield. He added three catches for eight yards. At the end of a lost season, the positives for the Vikings are what they can build on going into next season. Patterson has put himself firmly in place as a building block offensively. Minnesota entered Sunday allowing the second-most points in the league and on track to give up a franchise record for points. Dalton led an efficient passing game and the Bengals were the third team to top 40 points against the Vikings this season. Sunday was the 10th time in 15 games Minnesota has allowed more than 400 yards of offense. Against an overmatched secondary, Dalton was 27 of 38 for 366 yards passing and four touchdowns. Cincinnati is undefeated at home this season and has scored more than 40 points in four straight home games. Meanwhile, the Vikings were without rookie Xavier Rhodes and lost Shaun Prater early because of an injury. Chris Cook missed some time with an injury Sunday and was generally targeted by Dalton when he was in the game. Dalton, one of the toughest quarterbacks in the league to sack, was sacked just twice, both coming on the same possession late in the game with the outcome no longer in doubt. Cincinnati only ran the ball for 81 yards, but didn’t need to try and do much on the ground. Like in 2011 when Minnesota gave up historic passing numbers, Dalton made it look easy through the air and the Bengals didn’t need to run the ball. A.J. Green, one of the league’s best receivers, had seven catches for 97 yards. On the other side, receiver Marvin Jones had six catches for 85 yards. And running back Giovani Bernard had one of the highlight moments, taking a short pass 41 yards while weaving through the defense. With Cincinnati taking control for good in the second quarter, Vikings coach Leslie Frazier decided to let Adrian Peterson rest his injured foot and groin rather than risk the league MVP in a blowout. Peterson had running room against the Bengals’ fifth-ranked run defense, but didn’t look himself and didn’t show the burst or explosion that was so easy to see last season. Cincinnati scored to open the second half, and Peterson started Minnesota’s next drive with an 11-yard carry. It would be his last touch of the game. 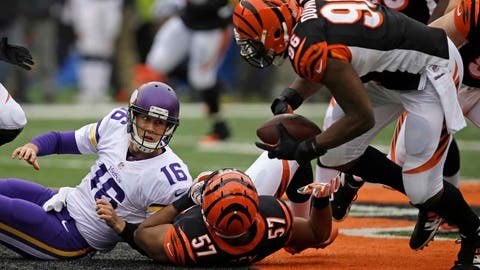 After a three-and-out, the Bengals scored again and Peterson rested. Peterson had 10 carries for 34 yards in the first half, finishing with 11 carries and 45 yards. With backup Toby Gerhart apparently reinjuring his hamstring, Joe Banyard got the most extensive playing time of his career and caught one pass as the Vikings abandoned the run.